What’s Your Pool Shape Personality? Round or rectangular? Freeform or geometric? Different pool shapes set a different tone and atmosphere. Depending on the outdoor living space you’re trying to create, your pool shape can either make or break your backyard’s ambiance. Smooth and natural, rounded pools such as oval shaped, kidney shaped pools and free form styles create a sense of relaxation. The curvy lines of these pools allow these lagoon-like waterways to create a contrast with their surroundings, and provide a more softer and creative look than many of the more rectangular designs. Rectangular pool shapes are the most classic swimming pool design, and are suitable for almost any home and garden given that houses are also often rectilinear in shape. 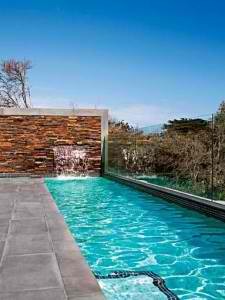 This shape of pool is also ideal for those who want to use their pool to swim laps. It’s simple, well defined, and depending on the features and finishes, can look incredibly modern and luxurious. No one has to strictly be a “roundy” or a “squarey”. In fact, most homeowners combine elements and pool shapes from both round and rectangular pools when creating their ideal pool. Taking inspiration from rectangular-shaped pools can provide guidance when building a pool for fitness, while incorporating freeform or rounded designs can allow you to creatively blend relaxation into that very same aquatic space. Take your time and consider what it is that you really want for your pool. Explore the many options available to you by perusing pool pictures and speaking with pool builders and contractors to uncover your true pool shape personality.